And so... SUPER GROVER to the RESCUE! Since I am still loving white and gold, I decided to cut some 3"x4" pocket cards of both gold foil and white. This size is perfect for project life style projects including the new Season of Style mini album SU has out. (See here to purchase one of my demonstrator samples or to purchase for a Christmas gift). I started things off with a bang by EMBOSSING a card, WOWOWOWOW... that's the gold foil alright. Ummm... I think I need some more. I then moved on to punching and stamping some out. 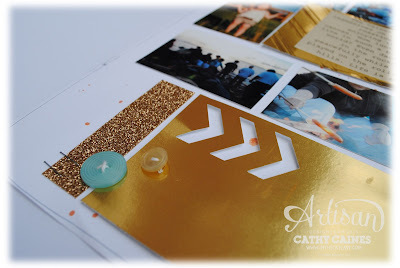 As I was embossing some gold powder onto the white cardstock, the wheels were turning... 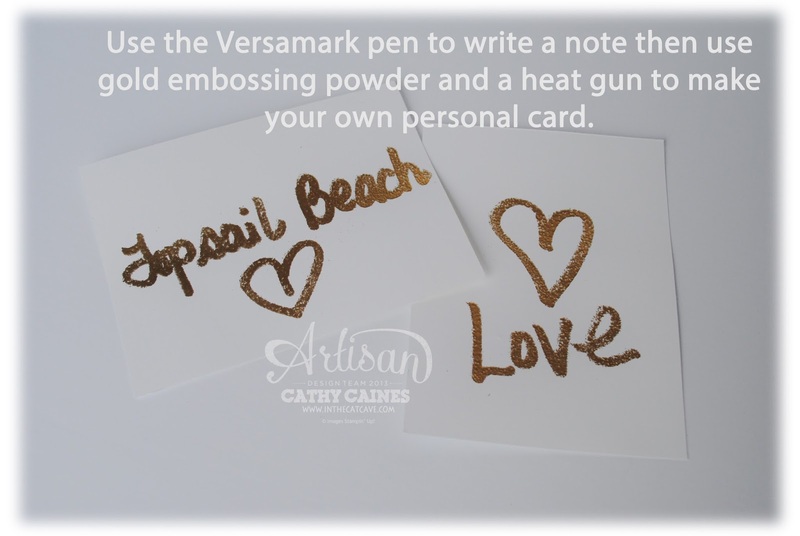 I grabbed my versamark pen and started to write out a couple cards and then emboss that... Ummm. Yeah. Genious. This is a great way to add something special to your cards and your layouts yet still have an 'adult feel'. ... well, I stared at these cards and I thought about the sunset. 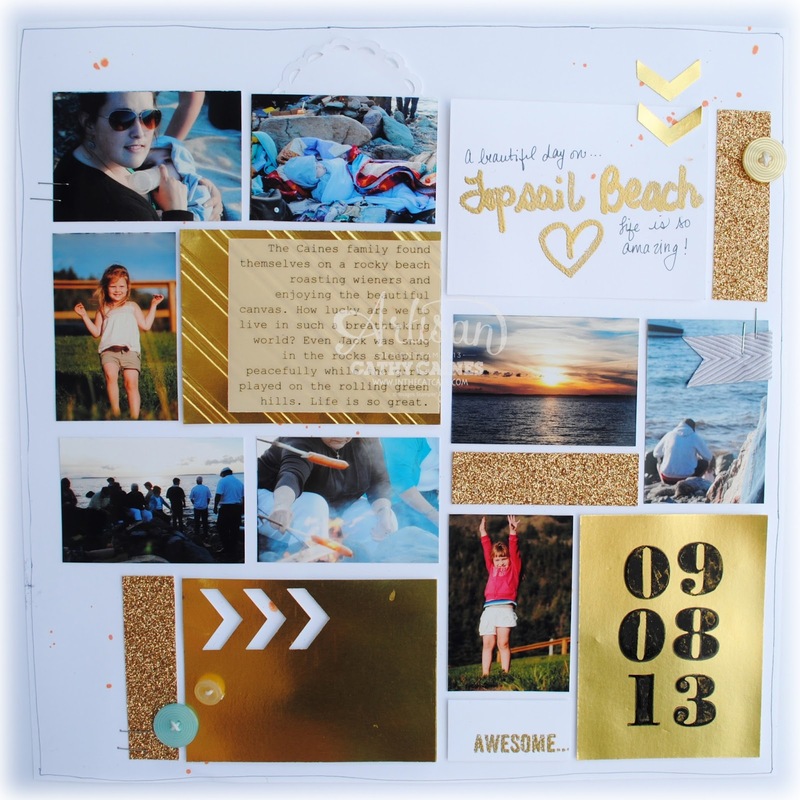 And then I remembered that my family went to the beach a few days ago... Now that's what I call inspiration! And here's some sneak peeks! I used my personalized card as the title of the layout. I also added some journalling. You can see that I spritzed some tangerine tango drops behind my page in the corners. I also think the stapler adds a lot of "fun-ness"! I printed my journalling on vellum so that you could still see the pocket card behind. 8. Use your markers or paint and color it. 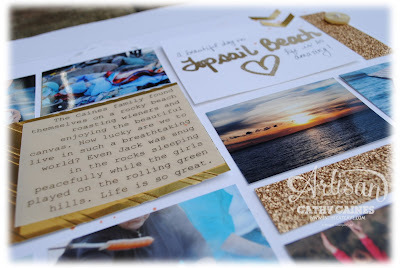 Keep going on the blog hop... Cindy has lots to show and shes AWESOME!! JOIN MY TEAM - I CAN'T WAIT TO MEET YOU! Oh My Goodness...not only am I amazed at this incredible page, but the thought process behind the page is just as fascinating! Dang girl!!! Your seriously worked the gold! I love it! I've been slow to warm up to Gold, but you've just pushed me off the fence!!! Awesome stuff lady! I never in my life thought I would be a fan of gold, but I think you have me sold :) The pocket cards are such a great idea, and I love how they came together on your page! Just takin' one name at a time... lol. 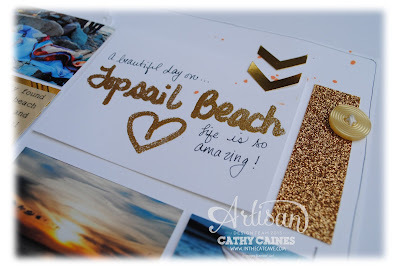 I had to take the gold foil and the embossing powder on the other end of the room so that I can get new inspiration... sadly I was playing with silver all day so I didn't fall too far from the tree. LOL! Cathy, I so love ALL you do!! I will never get enough of your projects! .. and I'm with the others, YOU are the reason I was finally pushed over the edge to embrace GOLD.. now I can't get enough! ..never thought I'd LIKE it and now you've taken another name to the gold LOVIN' side! Holy crap-ola Cathy! I can't haul my jaw off the floor! I love that you took the pocket card inspiration and put it on a layout. So pretty! I can't wait to use some of these ideas in my Project Life album! Buttons On a Card = Fun! 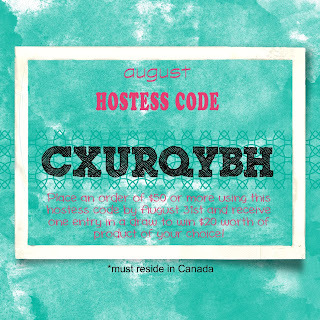 A quick card and reminder!